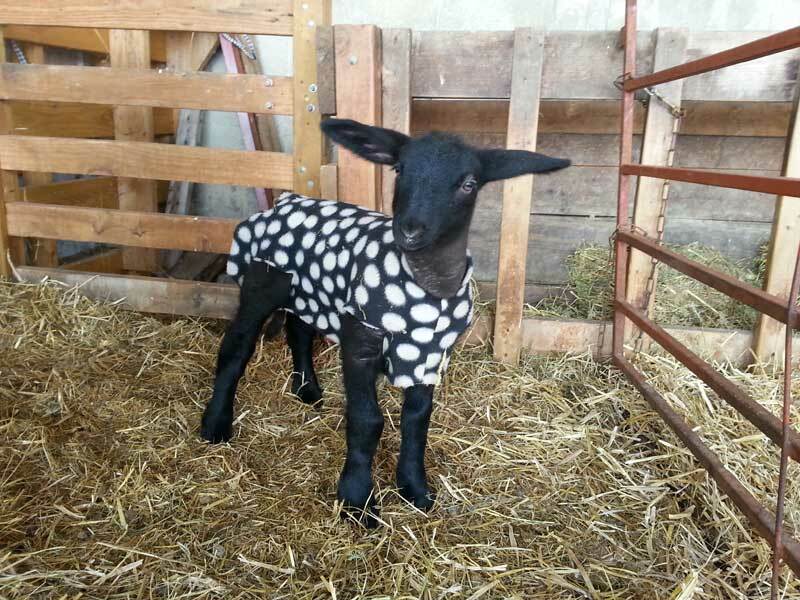 2015 lamb with polar fleece coat — helps retain body heat. Kelly Vorac makes many of our lamb coats. All Suffolks are born black — fleece begins to change to white around 50-60 days of age. Sunday, April 19, 2015. 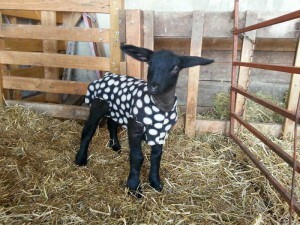 Frederick County Sheep Breeders — Spring Farm Tour — at Bridgestone Manor Farm, Eldersburg, MD. For more information go on the FCSB website. The 2016 Spring Farm Tour will be announced. Saturday, May 2, 2015. Had 4-H Project Lambs in the Club Lamb Show and Sale at the MD Sheep & Wool Festival, Saturday morning, May 2nd. Sold two project lambs in the sale. May 2-3. Frederick County Sheep Breeders – Food Stand. Had nice weekend weather at the MD Sheep & Wool Festival. Food stand did very well, ran out of food to sell. Early June. Cut and baled first cutting of grass hay. Around 220 round bales of hay. Looks good so far. Sunday, June 14. Frederick County Sheep Breeders annual picnic — held at Pat & David Schooley’s farm — Old Forge Farm, Hagerstown, MD. Saturday, August 1, 2015. PA Ram & Buck Goat Sale. Late August, 2015. Began breeding our ewes — and will breed a few ewes for other Suffolk breeders. Using 5-6 rams for 2016 lambs. Saturday, Sept. 12, 2015. In-The-Streets Festival in Frederick. A few FCSB members sold their woolen hand knits and yarn. September 17-18, 2015 – Bluemont Fair, VA. Vorac Suffolks supplied 75% of the lamb sausage that the Loudoun Valley Sheep Producers sold. Went over great, they sold out. Great Frederick Fair, Sept. 18-26. We Showed in the Suffolk Show on Wednesday, Sept. 23rd. — had some excellent ram lambs and ewe lambs. Ram lambs 1538 and 1544 were the Champion and Reserve Champion Rams. 2015 Fair photos will be posted. All of October. Jumbo’s Pumpkin Patch, Middletown, MD. Each year we have 2 ewe lambs in their petting zoo. Friday, November 6, 2015. Frederick County Sheep Breeders Annual Dinner, at Dutch’s Daughter Restaurant in Frederick, MD. Excellent turn out — food was great! Compost is available. Do you need a pick-up truck load of compost, at least 3 cu. yards? We load your truck. $25.00 per truck load.